The U.S. EPA said it's not aware of any sources that would be adversely impacted by the recent court ruling that vacated the stay on the Maximum Achievable Control Technology rules. Public and private enterprises in Oregon are working diligently to develop and expand a local biobased economy, according to speakers at the Pacific West Biomass Conference & Trade Show. Viability of electricity generation from biomass in the Pacific West was the topic of a breakout panel discussion at the Pacific West Biomass Conference & Trade Show in San Francisco, Calif., Jan. 16-18. Thinning of pinyon-juniper woodlands would create healthier stands, as well as provide biomass feedstock for energy production, according to Mike Baughman, executive director of the Lincoln County, Nev., Regional Development Authority. 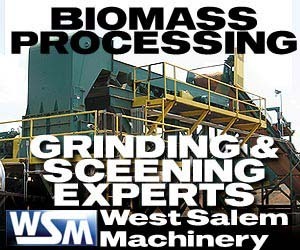 Key factors to fuel handling design and implementation include raw material supply and power purchase agreements, according to Desmond Smith, vice president of Bruks Rockwood Inc. and speaker at the Pacific West Biomass Conference & Trade Show. Attendees at the 2012 Pacific West Biomass Conference & Trade Show in San Francisco, Calif., Jan. 16-18 had the opportunity to learn about current trends in financing mechanisms during the event's opening general session. The third annual Pacific West Biomass Conference & Trade Show kicked off with a day-long tour, including one of the country's most innovative wastewater treatment plants, as well as an on-farm dairy digester power system.